This refreshing Hungarian cold peach soup can be a sweet meal starter, but it is often served as dessert. Except for the sugar syrup, this is a no-cook soup. The wine and brandy give it a nice kick. To save time, use canned peaches. In a medium saucepan, cook brown sugar and 2 cups water for 10 minutes. Remove from heat and cool completely. Dice 3 of the peaches, place in a large bowl and toss with 2 tablespoons lemon juice and 1/3 cup granulated sugar. Refrigerate. Puree remaining 5 peaches until smooth and place in a large bowl. Add lemon zest, 3 tablespoons lemon juice, cooled sugar syrup, wine, cinnamon, nutmeg, salt, and brandy, mixing well. Add reserved diced peaches, combining thoroughly, and fold in whipped cream. Refrigerate for at least 2 hours. Serve in a chilled bowl garnished with a dollop of whipped cream, a few diced peaches and a sprig of mint (if desired). 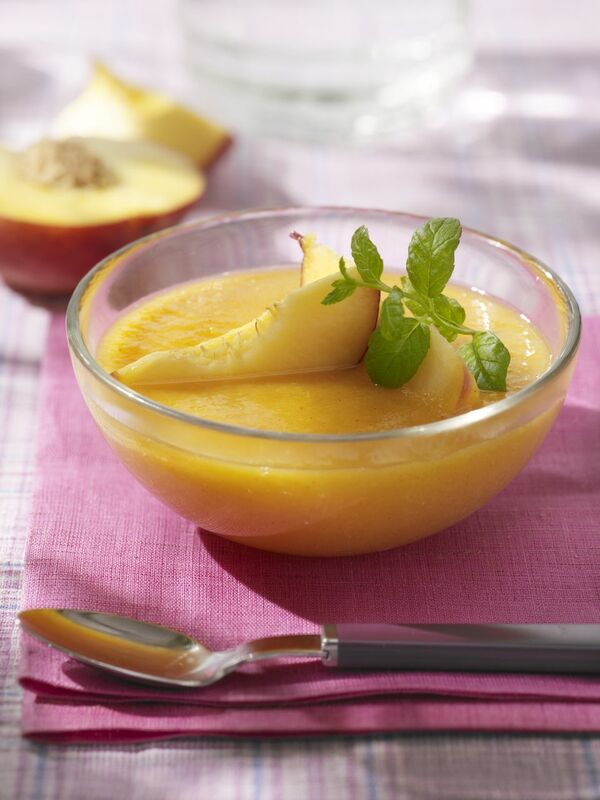 For canned peaches, use 3 (16-ounce) cans drained peach halves, reserving 2 cups of the heavy syrup. Cook the syrup with 3/4 cup light brown sugar and cool. Continue as for the fresh peach recipe.